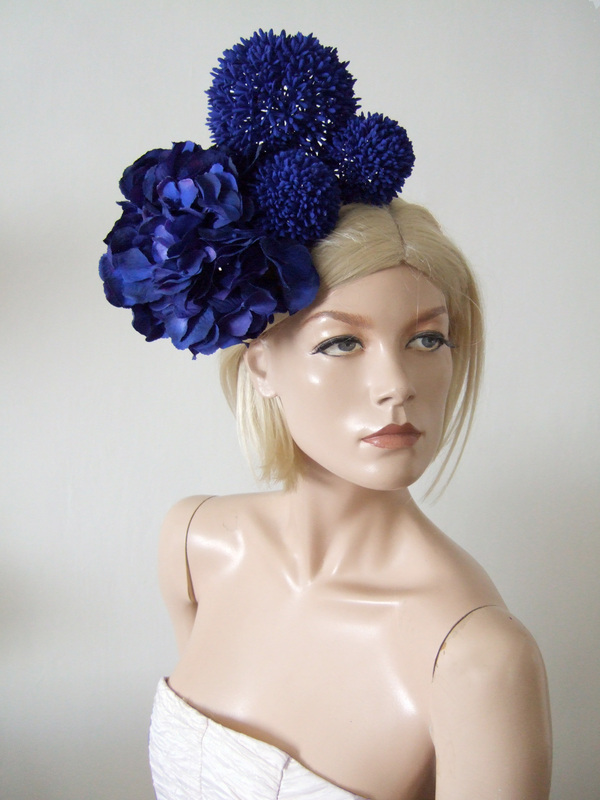 Laura Apsit Livens Headpiece called PURE, from her Blue Epoch Collection. A large cluster of Hydrangers in a deep blue with Purple undertones, and three Pom Pom shaped leaf balls in matching tone. Laura Aspit Livens is one of Londons most creative Milliners, creating all pieces by hand with no machinery, using traditional techniques, with modern new ideas and materials. Clients includes Paloma Faith, Rita Ora, Jessie J and the Duchess of Westminster. £40.00 per day, plus £100.00 deposit refunded on return. Attaches by wired alice and a comb. Headpiece Measures 4.5" x 9.5" x 6.5" excluding the band. For tips on selecting the right style of hat for your face, height, body and face shape, Check our "The Hatista" Style Blog. Here we also update you on current season trends and colours, events and loads more. For Ideas on Colour Combinations, Styles and Shapes you can view or follow our boards on Pinterest.